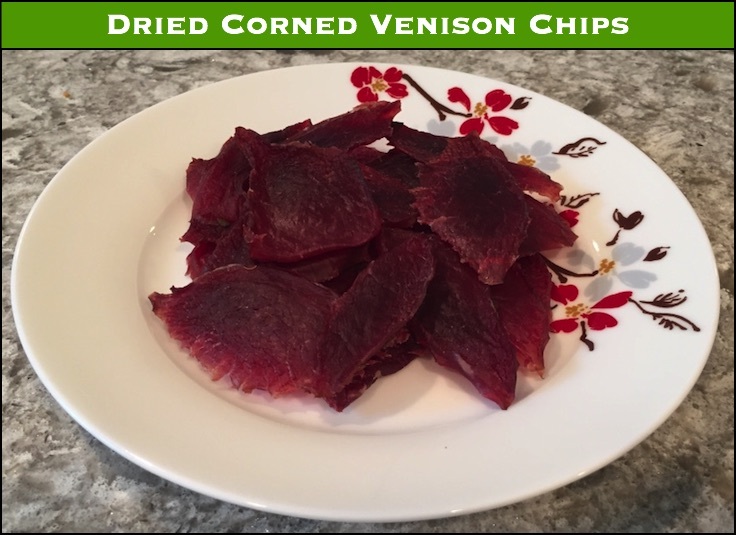 Corned Venison Jerky – You can dehydrate your venison after you corn it as an alternative for storing it. It will last a long time in the fridge, and comes in handy while cooking, or as a snack by itself. 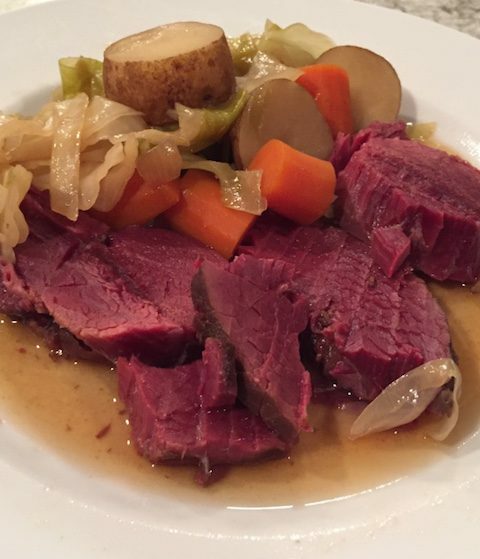 I have been a fan of corning venison for years. I love the flavor, and I love the options braising it and smoking it. 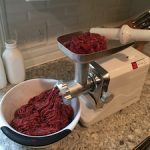 Another reason to corn venison is if you have some gamey meat. If you shot a buck that had a little funk, there is no better way to remove gaminess. And believe me, I’ve tried pretty much every way imaginable. I have been wondering for a while now how corned venison would be dehydrated and made into a jerky. 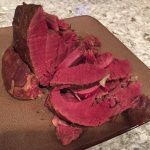 As a test, I took the two eye rounds from the buck I shot last year, and threw them in the brine with my normal corning cut – the sirloin tip – so I could test some jerky out. The eye of round comes from the hind quarter, and is a cylindrical roast that resembles a tenderloin. This resemblance is in the looks department only – don’t throw an eye on the grill unless you’ve done some serious tenderizing to it. I picked it for this test because I could run it through my slicer, and get some nice little circular disks of meat that have absolutely no connective tissue through them. Also, being a test, I wanted something small to start with. You could dehydrate any cut of venison, but rear quarter roasts are best because you can get sizable pieces of clean grained meat resulting in great jerky. I covered corning in an earlier post. After you corn it, you are really just slicing it and dehydrating it, similar to any jerky making process, as we did here. I cut it a little thinner than usual, but kept the slices in the realm of 1/8th to 1/4 inch. They were done dehydrating in about 4 hours, the “dryness test” from the jerky post holds here too. As a stand alone jerky – it was good, but I didn’t LOVE it. It was on the salty side, and when I eat jerky, I like it a bit sweeter. 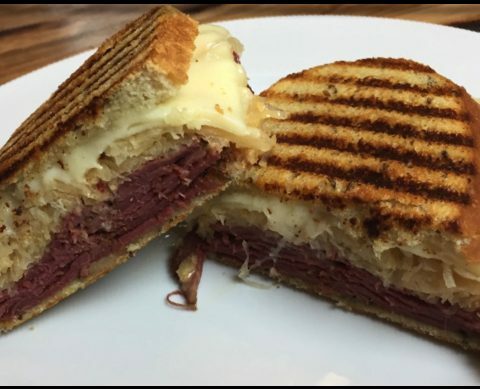 Outside the saltiness, it tasted like a corned beef flavored jerky – not bad for an occasional snack, I but I wouldn’t binge eat the whole batch. After a little pondering, I did find an AMAZING use for my corned jerky. Corned Venison Hash! 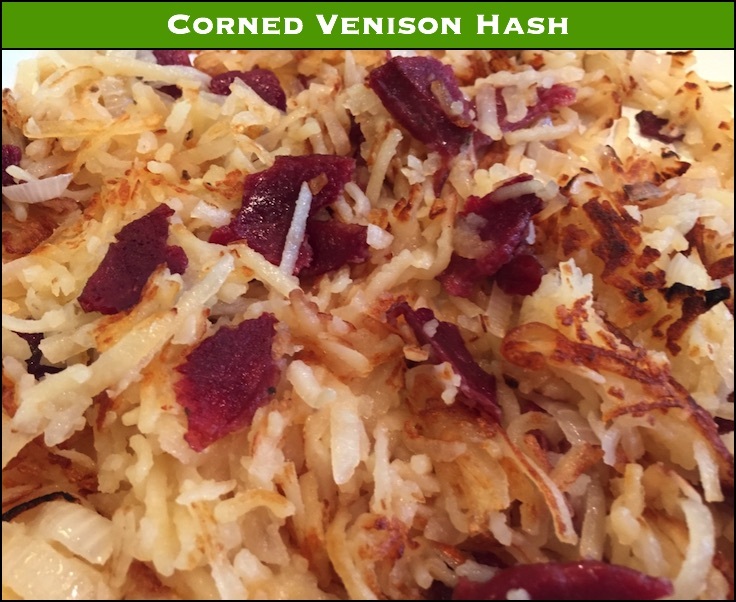 Hash made from dried corned venison – adds the flavor of corned beef with the texture of bacon – a winning combination! Now, I’ll regularly make hash from left over braised corned venison. When I do, I usually use dried hash/potatoes. This lends itself perfectly to corned jerky. Take a number of your jerky chips, and crumble them up into about dime size pieces. Add the jerky crumbles to the dry hash, and cover everything with near boiling water for about a half hour. Drain the result, and fry the hell out of it just like you would any hash. 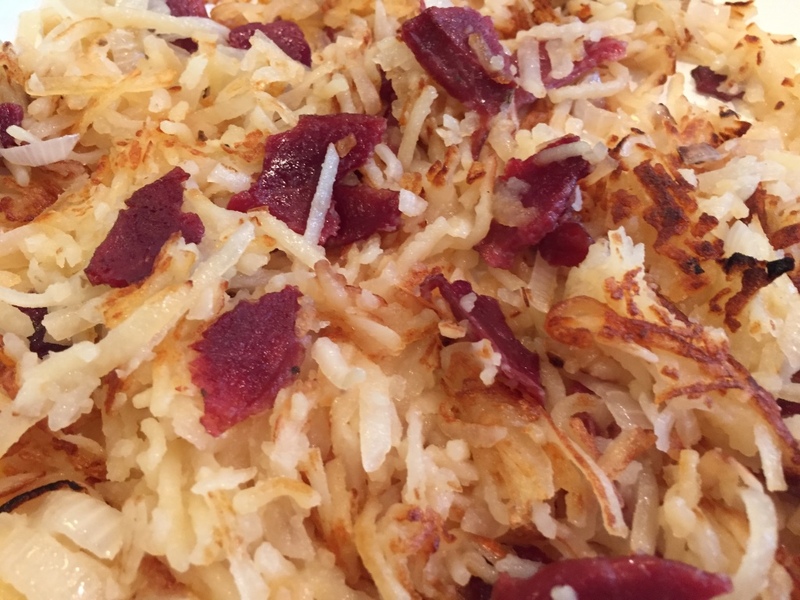 The rehydrated corned venison chips add the nice corned beef flavor to your hash, and have a texture very similar to cooked bacon – just what you wanted for breakfast! So, when you corn a roast, throw some extra venison in for some jerky and keep it in your fridge – you’ll have something a little different to add in to your recipes! Next Next post: Brining Venison – Add flavor and tenderize in one step.